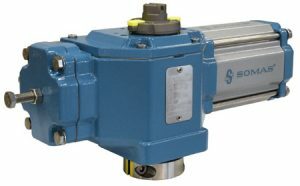 SOMAS actuators offer low friction and eliminates any delay. The actuator and valve work as one cohesive unit optimizing the control function as much as possible. All valves and their functions are thoroughly tested before they reach you as the end user. All if our solutions meet the requirements presented within all different application areas, both when it comes to function and accessibility. How are SOMAS actuators used? When a valve needs to be operated remotely, or is frequently used, it needs to be fitted with some type of actuator. Pneumatic actuators have become highly regarded because of their relatively simple and compact design, great price and because they are unaffected by whatever conditions they are installed and operated in. By equipping the actuator with various accessories, it can be used for both control applications as well as strictly on/off applications. Most customers that utilize any of our valves also uses one or several of our pneumatic actuators. For more information about double-acting actuators, or any documentation related to any of our other products or services please click below. You can find your document by selecting the appropriate category. Are you having a hard time locating a specific document? Contact us and we will help you!